To avoid the risk of bleeding under the stencil, makeup wedges and acorn shaped sponges work great to apply paint, temporary tattoo inks or dry powders. Sponges should be slightly damp, it is best to apply water to the paint and then pick up the wet creamy paint with your damp or dry sponge. To avoid smudging, carefully wipe the stencil off with a moist sponge (and let dry) or a dry paper towel between uses, and make sure that you are painting over a dry base. When tapping the paint hold the stencil firmly against the skin using the 2 tabs on each side of the design. To create a 3-D effect tap with one color, then slide the stencil over slightly and tap with a second color. These stencils can be used many times, but be gentle with them so they last a long time. Use a snap ring to hold your stencils so you don't lose them. 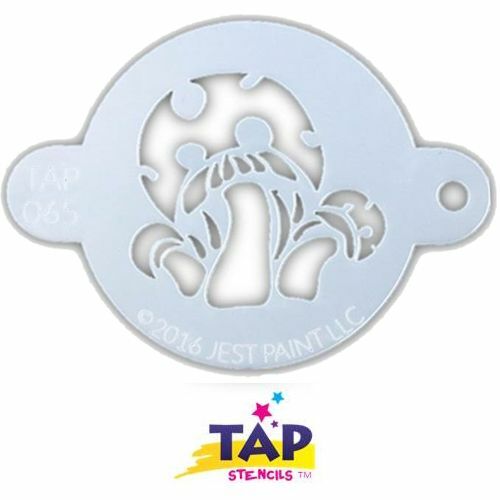 Stencil is approx 2" wide and are great for adding dimension to your designs in a quick and easy way.